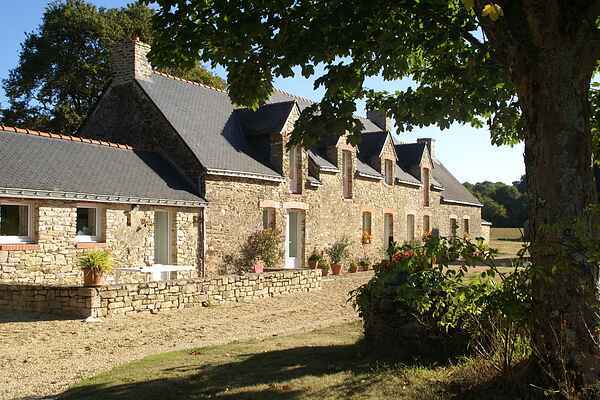 This large, lovingly restored vacation home is surrounded by woods and is located only 3.5 km from the sea and beach. You enjoy a detached home with a large garden and south facing terrace. So peaceful: in the morning there are deer coming over to the back garden to wish you good morning. You are on the peninsula of Guérande, the area where the famous Breton salt is harvested. The time and the manner of harvest determines the character: fine, coarse or the lovely \"fleur de sel\". This salt is used in Breton butter, cookies and cakes and is also found on the tables of 3-star Michelin restaurants. To us this is an intricate detail, for a French person it is a necessity. Maybe you'd prefer a visit to the medieval village of Guérande (12 km), completely walled in and with lots of shops and restaurants (Breton crêpes!). Do also pay a visit to the lively beach towns of La Baule with its 18-hole golf course (19 km) and Le Croisic (24 km). Or the Pointe du Castelli (17 km) with a beautiful view over the beach, rocks and the sea. Bakery, grocery shopping and restaurant in Assérac (3 km). A large supermarket in Herbignac (9 km).